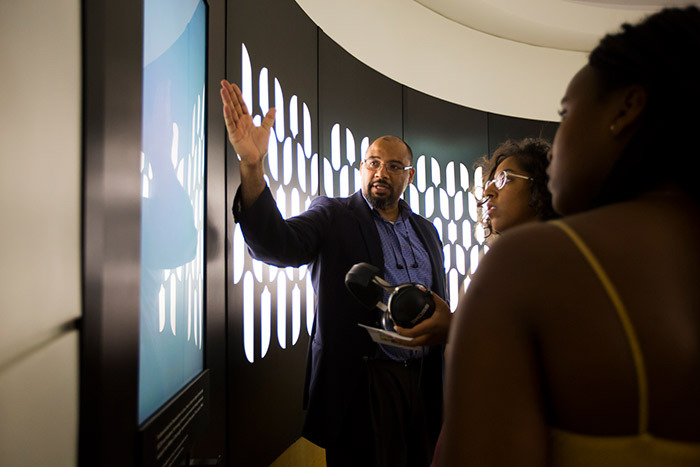 Pellom McDaniels III, Rose Library curator of African American collections, discusses “The Dream Machine” with attendees at the exhibit opening. 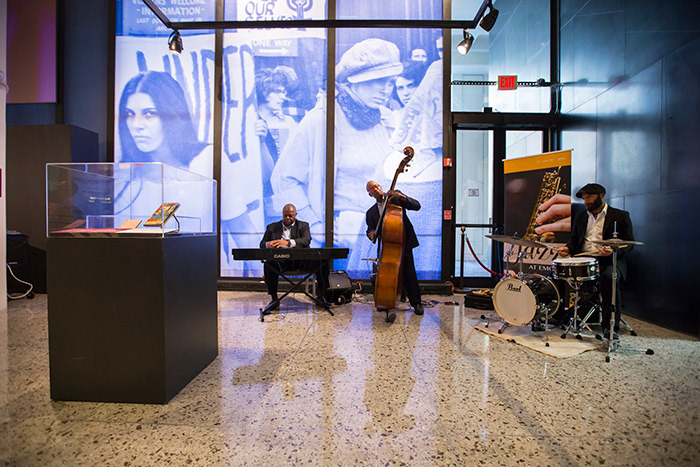 The Gary Motley Trio performs during the opening of "The Dream Machine." "The Dream Machine" exhibit takes its name from a device built around 1960 by writer and artist Brion Gysin that is supposed to induce a dream-like state. 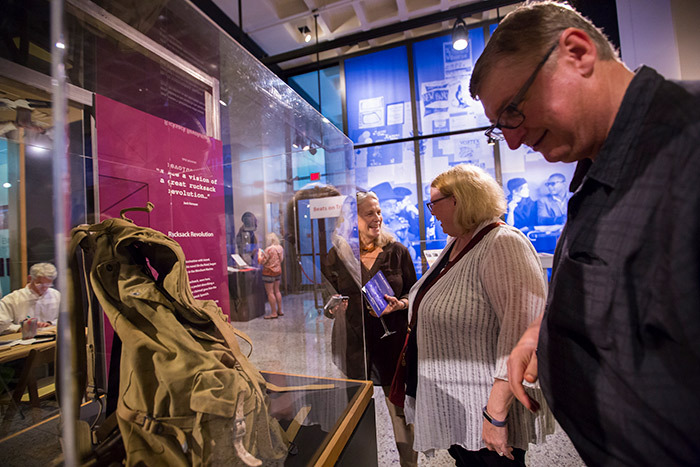 Jack Kerouac's rucksack is another highlight of the exhibit. 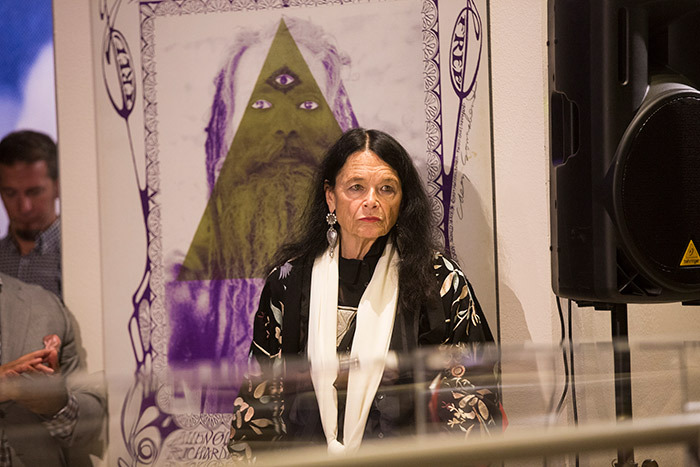 Beat poet Anne Waldman (center) was the special guest for the opening of "The Dream Machine." The exhibit is the first major consideration of the Beats in the U.S. in nearly a decade. Emory University Librarian Yolanda Cooper welcomes attendees to the opening of "The Dream Machine." 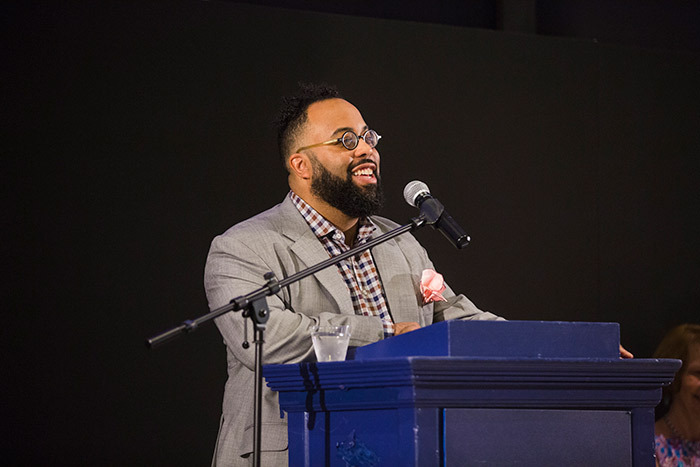 Poet Kevin Young, who now serves as University Distinguished Professor at Emory, provided curatorial oversight for "The Dream Machine." Beat poet Anne Waldman gave a reading from her poetry for the rapt audience. 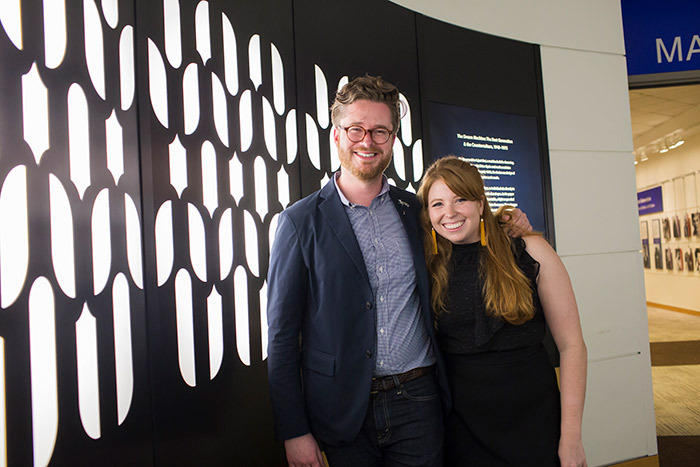 English PhD candidates Aaron Goldsman and Sarah Harsh are co-curators for the exhibit. 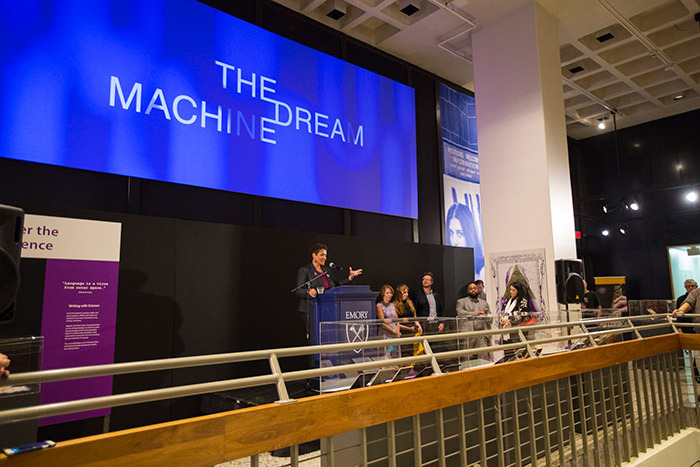 The Emory community gathered Thursday, Sept. 28, to celebrate the opening of "The Dream Machine: The Beat Generation & the Counterculture, 1940-1975," a new exhibit in Woodruff Library. The evening included an appearance by Beat poet Anne Waldman, who also gave a public reading and joined in a Creativity Conversation on campus, and music by the Gary Motley Trio. 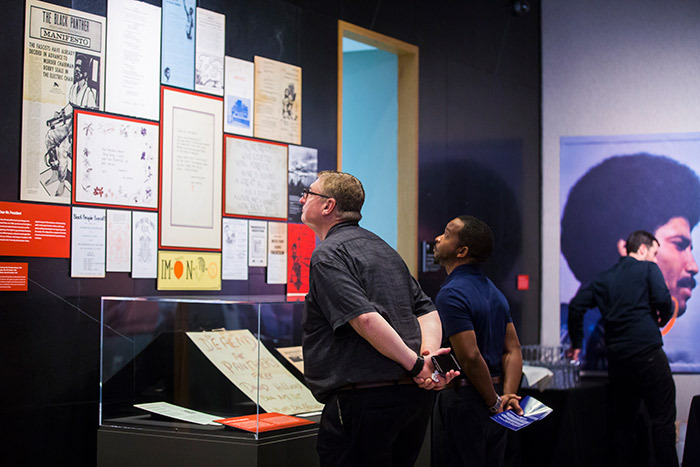 The exhibit reconsiders postwar literature and the ways it mirrored, predicted and remade the culture around it, with special focus on the influential group known as the Beats. Pulling from the Rose Library’s rich literary collections, especially the Raymond Danowski Poetry Library, the show rediscovers a number of fascinating countercultural writers and is the first major consideration of the Beats in the U.S. in nearly a decade. 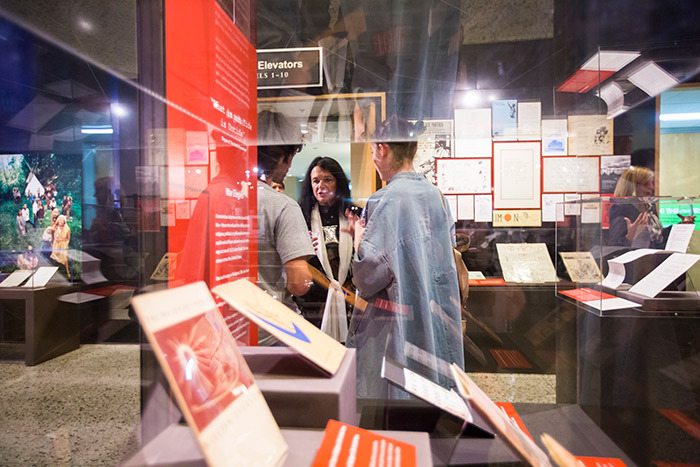 Highlights of the exhibit include the letter to Jack Kerouac that inspired "On the Road"; Kerouac’s 1942 passport, obtained when he entered the Merchant Marines, and a rucksack he later purchased; and an extremely rare first edition of Allen Ginsberg’s landmark poem “Howl,” of which there were only 25 mimeographed copies. 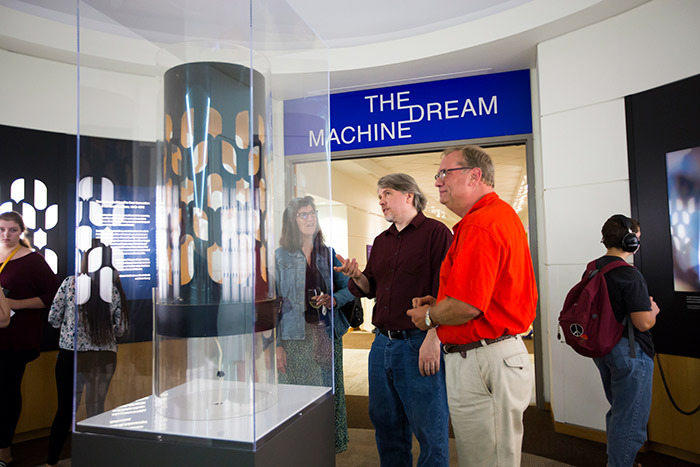 The exhibit also includes — and takes its name from — an original Dreamachine from the Rose Library collections, which was built around 1960 by writer and artist Brion Gysin. Made of a paper tube with cutouts of slits and designs, it spun on a record turntable with a light in the middle, which created a strobe-light effect. When a person sat very close to it with their eyes closed, the play of light through the eyelids induced a dream-like state. The exhibition was co-curated by English PhD candidates Aaron Goldsman and Sarah Harsh, who is also a Woodruff Fellow. Poet Kevin Young, former Rose Library curator of literary collections and of the Danowski Poetry Library, provided curatorial oversight; he is now an Emory University Distinguished Professor and director of the Schomburg Center for Research in Black Culture in New York City. The exhibition will run through May 15, 2018, in the Schatten and Corridor galleries on Level 3 of the Woodruff Library.